Anyone who has ever been hopelessly smitten, summarily rejected or pined from afar will savour this “I feel my heart beating” CD. 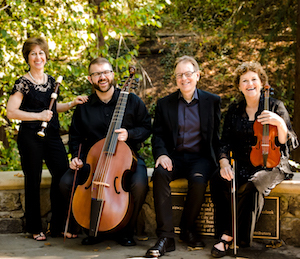 The five members of Musica Pacifica (cross-reference below), along with soprano Dominique Labelle in three of the five works, have assembled a well-thought-out musical offering centring around l’amour. Also of considerable interest was the decision to choose five different composers, allowing thoughtful listeners to compare and contrast approaches to similarly themed material. The Cantata, Guardati o Core (Guard Yourself, o Heart), from Agostino Steffani lifts off the collection with a rollicking opening and seamless transition to Labelle’s warning, “Do not be dazzled by the splendour and hopes of contentment.” As was the case throughout the disc, the music is wonderfully balanced and a meeting of stylistic minds, notably recorder (Judith Linsenberg) and violin (Elizabeth Blumenstock). In the return there’s a discreet wink in Labelle’s re-delivery. The ensuing recitative is much darker with just inventive enough realizations from harpsichordist Charles Sherman to complement, never distract, artfully inform the beautifully rendered word painting. Given the political and social climate of so many countries in 2018, the Arioso’s message, “Know that he [fill in the blank] is flattering you and he is lying.” continues to be valid. Some things never change. The final two arias are, in their turn, thoughtful and graceful and features a most commendable legato from Labelle. The first strictly instrumental composition, Giuseppe Sammartini’s Sonata in B Minor, Op. 1, No. 6 (London), is full of vivaciousness, energy and a fine sense of drama (with just a few moments of “rushing to the precipice”). Josh Lee (viola da gamba) is a a model of discretion—reinforcing, never overpowering his colleagues. The Andante e staccato offers still another layer of colour with the addition of guitar (John Lenti, who also does commendable double duty on theorbo), fuelled by an ideal tempo and compelling flow before a deliciously dark (more pangs of love, no doubt) ending thankfully yields to the major. Happiness and joy are the prime ingredients of the finale. It comes as no surprise that the overall artistic heat turns up several notches with Handel’s Mi Palpita il Cor (I Feel my Heart Beating) Cantata. The highlight of this grouping is also to be found in the longest movement, the aria Ho Tanti Affani in Petto, (My Worries Are so Plentiful). Of special notice here is the voice/recorder interaction (with “cruel and bitter pain” and the possibility of death setting the tone) where it feels as if the plaintive soprano is chatting through this miserable state of affairs with her string alter ego. Labelle’s changes of register are exquisite. The last aria speaks volumes about “my cruel beloved”. The near-perfect ensemble combines to offer soul-cleansing hope that “he” may finally do the right thing. Georg Philipp Telemann’s Quatuor No. 3 in G Major with its ornamental delights, largely free and easygoing mood stands in stark contrast to Handel’s love essay.